It’s no secret that One-on-One mentoring creates the best results. Our Individual Training Sessions provide the most rapid skills improvement possible. Not only do we leverage highly focused training on the physical skills/conditioning side; we zero in on Game and Situational Instruction so the athlete learns and understands how best to use their higher skill level. One-on-One lets us dig deep into a players learning style, and let us know how and why they learn, to build significant growth and improvement. Mistakes are expected and encouraged. Growth often comes at the expense of mistakes, so we welcome them, using the experience as a teachable moment. 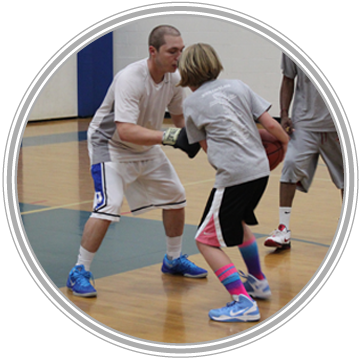 We strive to create the COMPLETE PLAYER – the shot-maker, ball handler, defender, rebounder, and floor leader. When combined with our Session-Based Training, Individual Instruction offers a highly-motivated athlete the greatest return on their skills training investment.